I was reviewing Inside the Park Collectibles current auction and came across a group of comical vintage bobbleheads that I knew little about. So naturally, I spent a little bit of time doing some research on them. 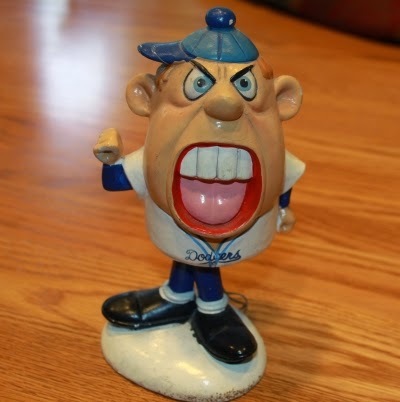 These bobbles are commonly referred to as "Weirdo" bobbleheads and they were produced in the mid-60's by a Los Angeles manufacturer called Kreiss & Co. This company was known to have made other similar toys and trinkets for Disney and other gift shops throughout the country. As you can see in the photos below, the "Weirdo" name for these bobbles is very apt. They are funny little toys that poke fun at the game and its characters. Also, each bobble type came with a hanging tag featuring a funny phrase describing the bobblehead. The auction house, Inside the Park Collectibles, has four of the seven (nine total if you include known variations) Dodger "Weirdo" bobbleheads known to exist. By the way, "Weirdo" bobbles were also made for the San Francisco Giants and it's assumed an equal number of available bobble types were made for them, as well. From what I understand, though, only a handful of the Giants bobbles are known to exist. I also need to mention that these bobbleheads are extremely scarce. 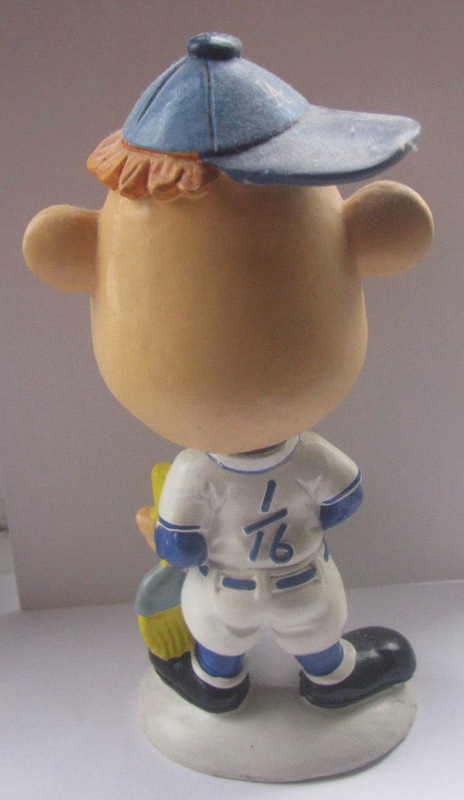 So scarce, in fact, that one Dodger version had sold for $5,000 at auction, and that was one of only two known to exist. Also, the bobble that was sold was found in the collection of Hall of Famer Andre Dawson - a noted bobblehead collector. Anyway, check out the four "Weirdo" bobbleheads available on auction below, and I have included photos of the other three "Weirdo" types that are known to exist for your edification. With regards to variations, two of the "Weirdo" types are known to have black face characters. I make note of which ones in the descriptions below. Of special note, much of the information attained for this post was found through an article written by Lou Criscione (an owner of Inside the Park Collectibles) at Collectibles Central and Warman's Bobbing Head Field Guide also written by Criscione. Clearly, Lou and his company Inside the Park Collectibles are the experts in this collecting field. "The Kids Back Home Usta Give Me Four Strikes!" No doubt this guy feels entitled to another pitch and wants to make sure the entire world knows that. "Nice Guys Always Finish Last"
This is an obvious reference to Leo Durocher. He is the originator of this famous phrase. "No Wonder I Couldn't Hit It, He Threw Me A Screw Ball!" Also note that the uniform number uses a fraction. "I'm Ready For That Clean Up Spot, Boss!" This is the last of available "Weirdo" bobbleheads available on auction through Inside the Park Collectibles. For reference sake I have included a brief description and a photo of the remaining three "Weirdo" types known to exist. It could very well be that more exist but remain undiscovered. So, this may not be a complete checklist. 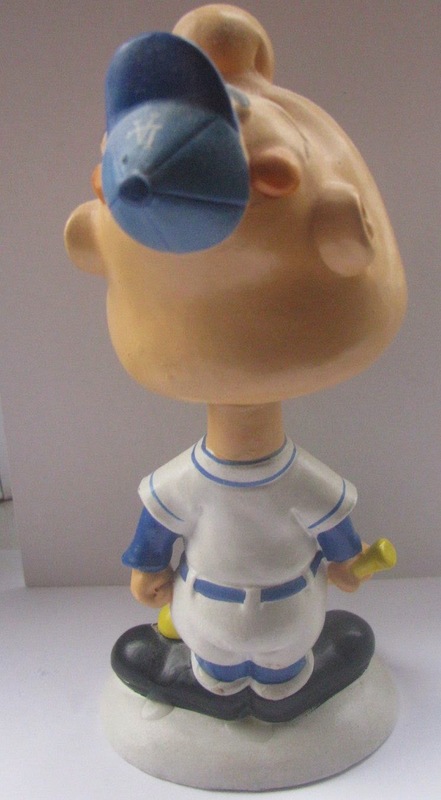 This next bobblehead is called "Stealing Base." I do not know what the original hanging tag descriptor said. If you happen to know please pass that along. We got a lead on a small collection of dolls owned by now Hall of Fame Baseball star- Andre Dawson. 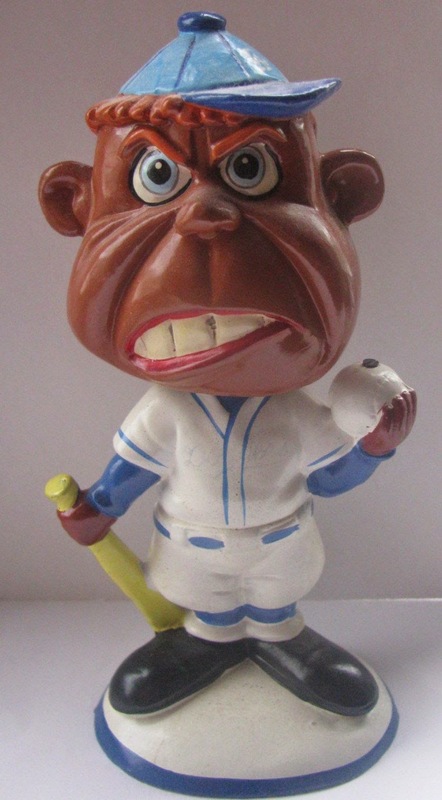 Mr. Dawson had collected with his son while doing card shows and had a small but impressive collection that included all of the rare Major League Baseball Black Face dolls. As his son got older, he lost interest in the dolls and Mr. Dawson decided to downsize. We arranged to meet at his house. We were a little nervous, as we really had never dealt with any celebrities. Mr. Dawson could not have been more hospitable and gracious as we entered his home. We were brought into a hobby room that displayed all of his trophies and memorable bats & balls. The bobbing heads were laid out on a beautiful pool table, all neatly boxed. 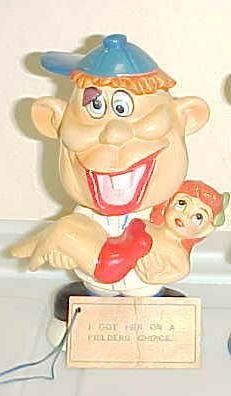 To our surprise, we opened a box and found a doll that shocked us both- another Dodger Weirdo- one with a grinning player holding a bathing beauty in his arms. We had bought and sold thousands of vintage dolls at that point and had never seen or heard of this doll. "I Got Her on a fielders choice"
BTW, the "Bather" bobblehead sold for over $5,000 and is highly sought after. 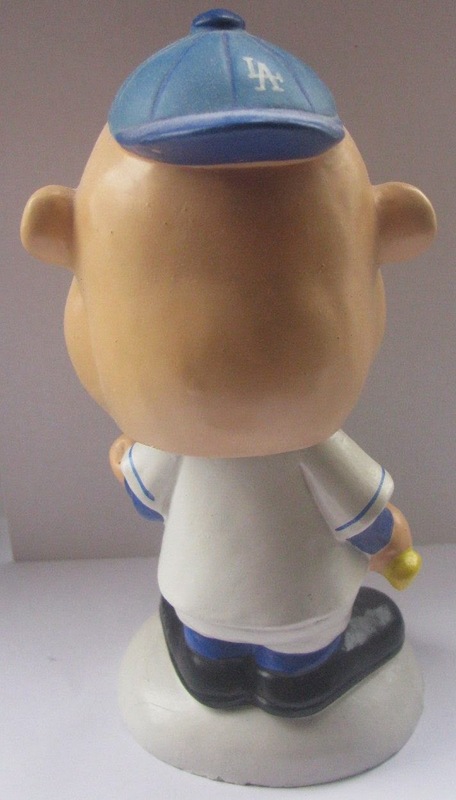 This next "Weirdo" bobblehead is also extremely rare. It is called the "Fly Swatter" and features a bobble that nods at his waist. 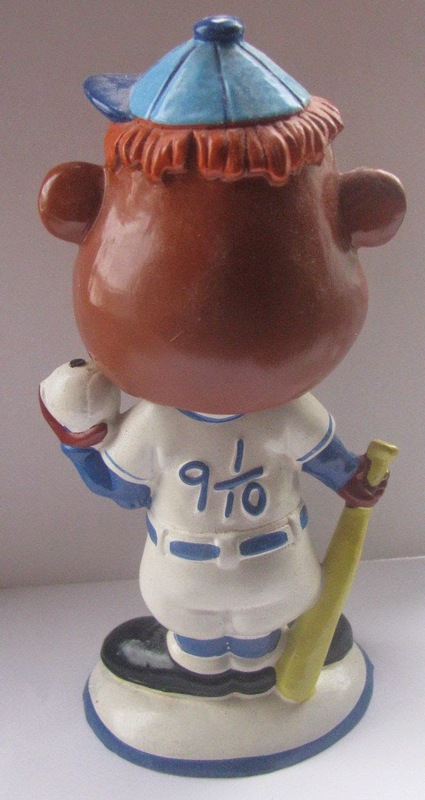 The bobble is also described as holding a fly swatter in his right hand, but that is not visible in the photo below. It is not known what the hanging tag descriptor says. This photo was found via Lou Criscione at Collectibles Central. 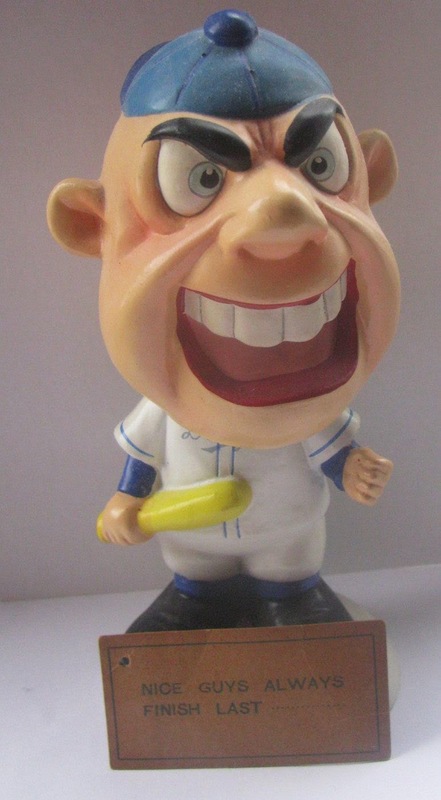 Like I said, more "Weirdo" bobbleheads may still exist, so keep your eyes out for them. You never know if you've come across a little gold mine. The more common "Weirdo" bobbles (those found in the above mentioned auction) could sell in excess of $1,000, but have been known to be found at prices ranging from $500 to $1,000. These are certainly must-haves for vintage bobble collectors.